The commission appointed in February had began hearings in Mumbai on Wednesday. It will also conduct hearings in Pune. The state government’s special public prosecutor on Thursday claimed before the commission inquiring into the Bhima Koregaon violence that the incident on January 1 could have been caused by a “third group” to “spread anarchy”. Witness Manisha Khopkar (44), who was attacked during the violence, told the commission that while a group had pelted stones at them, men with saffron flags had passed them on motorcycles while raising slogans. 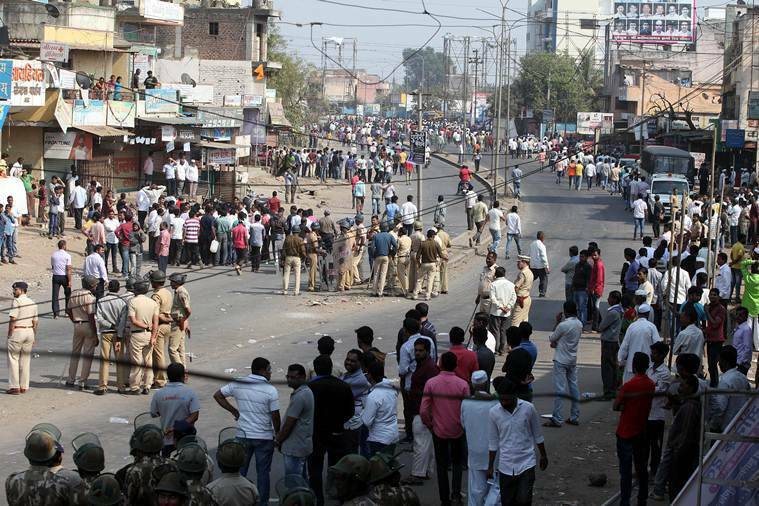 An FIR has been lodged against Samasta Hindu Aghadi leader Milind Ekbote and Shri Shiv Pratishthan Hindustan leader Sambhaji Bhide at Shikrapur police station, under which Bhima Koregaon village falls, to probe their role in instigating the violence against those who had gathered to pay homage to the martyrs of the battle of Koregaon on its 200th anniversary on January 1. The Pune Police has also booked the organisers and participants of the Elgaar Parishad organised at Shaniwar Wada on December 31, last year, alleging that provocative speeches at the event had led to the violence. During cross-examination, Special Public Prosecutor Shishir Hiray asked Khopkar that if it was neither those with saffron flags nor blue flags who had pelted stones, was it possible that the miscreants belonged to another group. “Is it possible that the agenda could be to create conflict between two groups to spread anarchy?” Hiray asked. To this, Khopkar said that she was not making allegations against any group. While commission chairperson Justice (retired) J N Patel said that the question was “very hypothetical”, Hiray said that the witness has been asked the question as she was aware of what “ideology” means. Khopkar was asked if she understood the meaning of ideology before she was asked about the involvement of a “third group”. Hiray submitted that there was a possibility of a third group with a “different ideology” being behind the violence. Hiray also questioned the witness on the history of the battle of Koregaon, asking whether she had any written proof about it. Khopkar said that she had heard the history from her parents, about the victory of Mahars while fighting against the Peshwas. Further, Hiray confronted Khopkar with three pending cases of cheque-bouncing against her in 2014-15. He also questioned Khopkar regarding her claim that the police had not included the fact that casteist slurs were cast against her and others by the miscreants on January 1. While Hiray claimed that she was deposing falsely, Khopkar said that she had mentioned it to the police but it was not recorded. Another witness, Tukaram Gaware, also started deposing on Thursday. During his examination-in-chief by the commission’s counsel, Ashish Satpute, Gaware said he had retired as an assistant inspector with the state and Mumbai Police in 2006. He added that he had visited Bhima Koregaon four to five times earlier and this year, he went with a larger group as it was the 200th anniversary of the battle.